"We cook from the heart and strive to create a positive and inviting experience that gives rise to fellowship." Our safety net services focus on meeting a person’s basic need for food and shelter, while acting as a gateway to other services. BFHP’s Dwight Way Shelter in Berkeley accommodates two shelters. Our women’s shelter (in operation since 1992) and our men’s shelter (launched in 1986), each have 32 beds. The Shelter offers those who are homeless a safe place to stay and support while they build income, skills, and seek permanent housing. The Shelter operates 365 days/year. 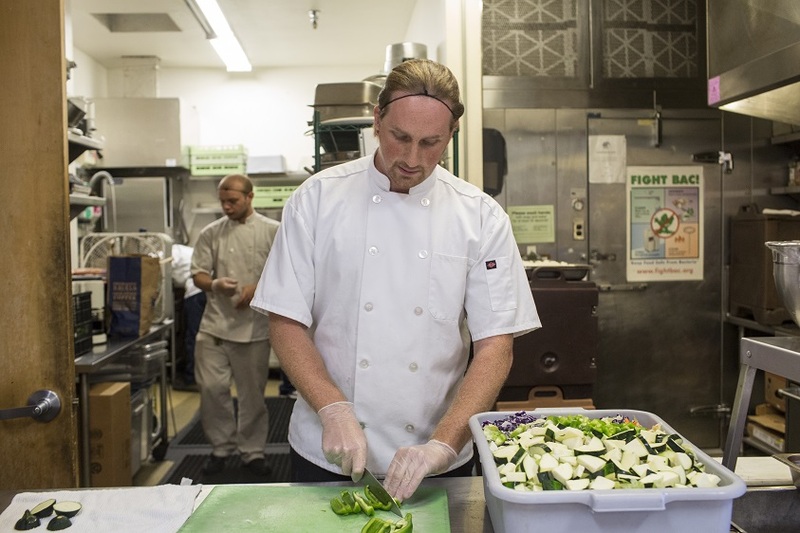 BFHP has the longest running free, weekday community meal program in the City of Berkeley. Our guests include those who are homeless and/or unemployed but also many who have housing and jobs and who depended on the program in order to free up income to cover other essentials like rent and utilities. Our community meal is served by our many dedicated volunteers. BFHP’s Community Meal is a drop-in, cafeteria-style sit down meal served in a clean and welcoming venue. Menus are created with nutritional value, dietary restrictions, and – above all – taste in mind. Our dinners are hot and are accompanied by salad, fresh fruit and bread. A vegetarian option is always available.